The Akiles MegaBind 2 is one of the most complete and professional punch and bind peices of equipment in its market. It's all metal construction is built to last and it includes a 14" punching throat for legal sized documents. With all metal construction and a heavy duty two handle construction the Megabind 2 is built to last and will stand up to almost any application. Additionally, the Akiles Megabind 2 is capable of punching and binding legal sized documents using legal sized plastic combs. Plus, the Akiles Megabind 2 comes with a twin loop wire closer that will work with Spiral-O 19 loop wire combs. Comb Binding Capacity: From 3/16" to 2"
Welcome to MyBinding video. This is a look at the MegaBind 2 by Akiles, a two-in-one binding system that punches and binds for both plastic comb and Spiral-o coil. For comb or coil, set your side margin control knob so that all punches are consistent throughout your project. And remove any of the die pins you may need so you get no half holes. And you can set the depth of margin so that punches are as far in as you need for your project. With scrap paper, make your first punch and if all is okay, begin with your project. Start with the covers and punch through all the sheets, punching in batches of 25 sheets or less per punch. With all your punches made, gather your sheets together. It's time to bind. To help you in comb selection, take your finished product and slide it into the grooves. Then you can read exactly what size comb or Spiral-o you need. Then, place your comb over the metal comb opener, making sure that the teeth face up so the project will face down and it won't fall apart in use. Pull down on the small arm to open the comb. Thread your book over the teeth of the comb, assuring they all go through all the holes. Then close up the comb. That's all there is to it to the comb binding. And now, for Spiral-o, with the same punches made, select your coil. And you can use the throat of the machine to hold your project in place while you thread the coil. Turn it around and have the ?C" of the coil facing into the machine. Place it into the groove and set your margin. This here will make sure that the clamp does not come down further than it needs to for your size coil. That's all there is to it to the Spiral-o. And there it is, the MegaBind 2 by Akiles. For more demos, reviews, and how tos on this product and many more, check out MyBinding.com. 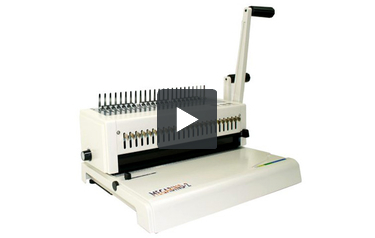 Heavy duty legal sized manual plastic comb binding machine. Made by Akiles who has a reputation for making some of the highest quality desktop binding systems available on the market. Similar to the Akiles Megabind 1 but includes a built in wire closer for added functionality. This makes it similar to some of the older Ibico binding machines. Heavy duty manual plastic comb binding machine with disengageable dies (the ability to punch any length of document up to 14 inch with a single punch), open throat design (punch longer documents with a two step punch process), depth of margin control (choose how far the holes are from the edge of the paper) and heavy duty legal length plastic comb opener. The Megabind 2 also includes a wire closer that allows it to be used with 19 loop spiral O wire. This type of wire is also sometimes called ibiwire and is designed for use with the 19 loop comb binding pattern. However, most comb binding machines don't come with the wire closer needed to finish documents with ibiwire. This makes the Megabind 2 fairly unique in its class and provides excellent added value for your dollar. Includes a convenient size selector on the binding table to allow you to quickly choose the right size of spine for your documents every time. Although the Megabind 2 can bind documents up to 2" with plastic combs it is only able to bind documents up to 9/16" with spiral-o wire. Documents larger than 9/16" will need to be bound with combs. The spiral-o wire is more difficult to come by that either plastic combs or standard twin loop wire. It is important to buy the right supplies for this machine (you can't purchase standard 3:1 pitch wire) if you want it to work. The manual punch on this machine is great for low to medium volume users. However, it could become quite tedious in a high volume production environment. An electric machine would be better suited high volume applications. The horizontal wire closer is a little bit more difficult to use and to master than the vertical variety included on most of Akiles other wire binding machines. Heavy duty all metal construction is indicative of the Akiles line of manual binding machines. This equipment is extremely well built. The wire closer is solid and should hold up for most users who bind moderate volumes of documents. High volume users might consider a heavy duty stand alone wire closer instead. Backed by a 1 year warranty from Akiles. However, it is very doubtful that you will need the warranty on this machine. For the price this is one of the best choices for manual plastic comb binding machines since it gives you the ability to use plastic combs, spiral-o wire and Zipbind spines. High quality metal construction means that it should hold up and won't break. However, it should not be used to punch more than 2 clear covers at a time or to punch metal, wood or other non paper materials. Great bang for your buck. Get one today. Can I use regular twin loop wire with this machine? Although this machine comes with a wire closer it punches and standard 19 hole comb binding hole pattern. If you have another way of punching paper (or buy pre-punched paper) you can use standard twin loop wire. However, in order to use the hole pattern produced by this machine you would need to order special Spiral-O 19 loop wire binding supplies. Luckily we carry those in a wide variety of colors and sizes.